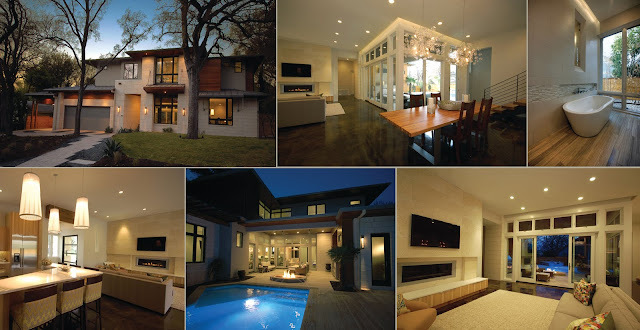 CGA Selected for 2011 AIA Homes Tour! The driving impetus for this Tarrytown residence was centered around creating a green and sustainable home. The owner-Architect collaboration was unique for this project in that the client was also the builder, Chris Shaffer with Greenbelt Homes, with a keen desire to incorporate LEED-centric principles to the design process. The original home on the lot was deconstructed piece by piece, with 95% of the materials either reused or reclaimed. The home is designed around the existing trees with the challenge of expanding the views, yet creating privacy from the street. The plan pivots around a central open living core that opens to the more private south corner of the lot. The glazing is maximized but restrained to control heat gain. The residence incorporates numerous features like a 5,000-gallon rainwater collection system, shading features, energy-efficient systems, spray-foam insulation and a material palette that helped the project achieve a five-star rating with the Austin Energy Green Building program. 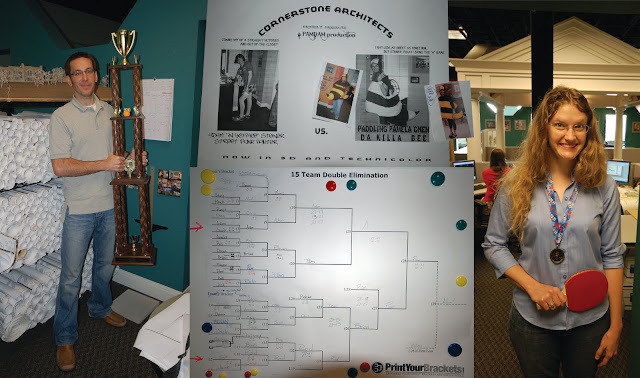 Introducing the Self-Proclaimed CGA National Ping Pong Champion! After 2 weeks of countless games, LOTS of trash-talking, and a super intense final match...Adam has been named the CGA National Ping Pong Champion. He now gets to proudly display the 5-foot (recycled) trophy in his office for all to see. Check out the proud winner, the official final match poster, the tournament bracket and runner-up Pam, who put up quite a fight! !